The ambition of Chipotle's Farmed And Dangerous series of online shows is laudable, but the result is a big cowpat of content that does the restaurant chain no favours, Peter Souter says. Listen, I so, so want to like Farmed And Dangerous. I want to like it because any client who invests in four 22-minute online entertainment shows, but doesn’t want them set in their own "burrito-selling, fast-casual restaurant", is to be encouraged. Any client, for that matter, who wants to play in long form should be hugged and kissed a lot. I also want to like it because I spent four years writing TV and radio drama on my little wander between Abbott Mead Vickers BBDO and TBWA. (If you are wondering, fun-playing-with-new-train-set score: high. Pay: very low compared with the wonderful world of advertising. Be warned.) Making good telly is a long, hard business. My six episodes of Married Single Other took three years of my life from start to finish. So respect to all who have a go. Yes, I want to like Farmed And Dangerous. I want to ignore the dodgy pun in the title. That doesn’t necessarily mean anything. Claire In The Community is radio comedy’s worst-ever pun title featuring a character called Claire, but it’s actually really funny. Maybe Farmed And Dangerous could be like that? Maaaybe. Quick history. Chipotle Mexican Grill doesn’t like paying for ads much and has in the past been quite clever about making itself famous without ever sitting through a media buying presentation. It gives away free burritos to sports and entertainment stars in the hope that they will munch and Tweet. Amazingly (and I suspect it may have cost a little more than just free floppy sarnies), that has worked pretty well. It also branched out and did a charming scribbly animation with Fiona Apple warbling over it, and still more punters felt compelled to buy food you don’t need forks to eat. Some grumbling in the ranks about the movie-ette being a bit misleading but, still, you have to admire its spirit of adventure. Anyhow, Farmed And Dangerous is its Citizen Kane: out on Hulu, in the comedy section – not the skip-me-in-five-seconds section, mind; the comedy section. It’s a satire on big agriculture doing horrible things to food and then paying people to tell lies about it. The Orson Welles of this outing is Ray Wise, a stubby dude you would recognise from Twin Peaks if you are my age and Mad Men if you are a mere slip of a girl. Now, imagine, if you will, the biggest hand you’ve ever imagined. Like a really, really big hand. A hand that has fingers the size of blue whales and a thumb like a jumbo jet. Then imagine that, somehow, that very, very big hand has been dipped in what would have to be a really sizeable vat of concrete and got itself a proper coating. Imagine how heavy that hand would be. Now you know how heavy-handed Farmed And Dangerous is. If two characters are going to talk to each other, one of them is required to be called Chip Randle while the other will glory in the name Buck Marshall. If we are going to have a firm of bad-guy PR people, we should expect that firm to be called iFib. If we need to know that someone is secretly spying on someone else, then prepare to see said spy wearing an "invisible" earpiece the size and shape of a fireman’s hose. Now, while we are taxing your imagination, picture the giant, blue-whaled finger and 747 thumb dipped in fast-setting concrete trying to write dialogue. Imagine how tiring that would be. Especially if it was attached to your normal-sized arm. You’d cut corners, wouldn’t you? You’d avoid the exhausting business of being human, logically motivated, realistic and pithy, wouldn’t you? You’d drag your exhausted giant, heavy hand across the page for a few strokes and say: "Heck, that’ll do." When we, as an industry, venture into new fields, we must expect to be judged by the same standards as the people alreaday in that field. If we are going to do more long form, shouldn't we be looking to do it better? OK, rest your hand for a minute. Let’s get out the plotting cards. Exploding cows? They always work, don’t they? Petrol-based food pellets? A slight stretch, but bear in mind how hard it is going to be to take the card back down with a giant concrete hand. And a PR company that will spend a few days trying to remove a YouTube clip, apparently unaware that those cow-horses tend to bolt the stable pretty quickly? You have a fair idea of how Farmed And Dangerous kicks off. Look, I know that all of the above is supposed to be ironic. And, I say again, it is a huge achievement and a daring bit of frontier-blazing. Some bits are genuinely funny. It’s just that when we, as an industry, venture into new fields, we must expect to be judged by the same standards as the people who are already in that field. My kids can watch Modern Family or The Simpsons at the click of a Netflix icon. If we are going to do more and more long form, shouldn’t we be looking to do it better and better? Remember when people in this country used to say that the ads were better than the programmes? Well, now we have started to make the programmes. Let’s make them better than the programme-makers do. Farmed And Dangerous is Chipotle’s first headlong foray into "TV", but the restaurant chain has been intent on marketing itself differently since 2011. Before that, the brand used a number of traditional ad agencies, but the relationships never lasted long. Between 2004 and 2009, Chipotle worked with Mother New York, TDA Advertising & Design, DeVito/Verdi and Butler, Shine, Stern & Partners, and earned a reputation as a fickle client along the way. In interviews, Chipotle’s head of marketing, Mark Crumpacker, complained that agencies would try to be "too clever" with their messages, so the company decided to make its own ads. Early projects included a series of billboard posters that poked fun at a nonexistent ad agency (eg. "our ad agency insisted we show a burrito in this ad"). Chipotle really hit its stride when it teamed up with Creative Artists Agency to make short films. The first was called "back to the start" and featured the country singer Willie Nelson covering Coldplay’s The Scientist. The animation accompanying the soundtrack showed a farmer expanding on an industrial scale, before realising his mistake and returning to more organic methods. The video was first released on YouTube, but got so many hits that Chipotle turned it into a two-and-a-half-minute TV campaign (its first). "Back to the start" won two Grands Prix in Cannes in 2012. In 2013, it released another short film, "the scarecrow". 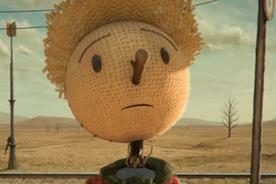 The animation has a similar message – about sustainable farming – and shows a scarecrow despairing at the state of food production and opening his own stall using nothing but fresh produce. The singer Fiona Apple covered Pure Imagination from Willy Wonka & The Chocolate Factory. This time, Chipotle also created an app game, with Moonbot Studios, where players rescue animals from battery farms.